Liviu, 38, is the chief executive of his own company, Cyborgnest, which designed the implant. He sees this as the first step in an entirely in-built navigation system and hopes to end what he calls “generation screen”. “You walk on the street staring at your phone. You want to get somewhere but you have no idea what’s happened in the world around you because all you did was stare at the screen on the way,” he says. His invention is highly unusual but actually seems tame in comparison with Rich Lee, a 40-year-old cabinet-maker from St George, in the US state of Utah. Rich is a grinder – a biohacker that does extreme body modification. In his fingers, he has magnets and two near-field communication (NFC) chips that can be programmed to link to websites or open car doors, among other tasks. He has a biotherm chip in his forearm, which can constantly monitor body temperature (but are usually used in pets), and headphone implants right in his ears. Watch Catrin’s full film here. He has also attempted “Crispr” – probably the most extreme and controversial kind of biohacking, a technique used by scientists to target and edit your genes. While scientists are still working out the limits and dangers, Rich is experimenting at home and admits if he gets it wrong, he could kill himself. “We’ve got all this genetic engineering knowledge and what I’m backing is the concept of being able to change your genes or get genetic modification like you would get a tattoo,” he says. This home biohacking can of course go very badly wrong – Rich pulls up his trouser legs to reveal a selection of scars from implanted shin guards that got so swollen they had to be removed, which he did with pliers and no painkillers. 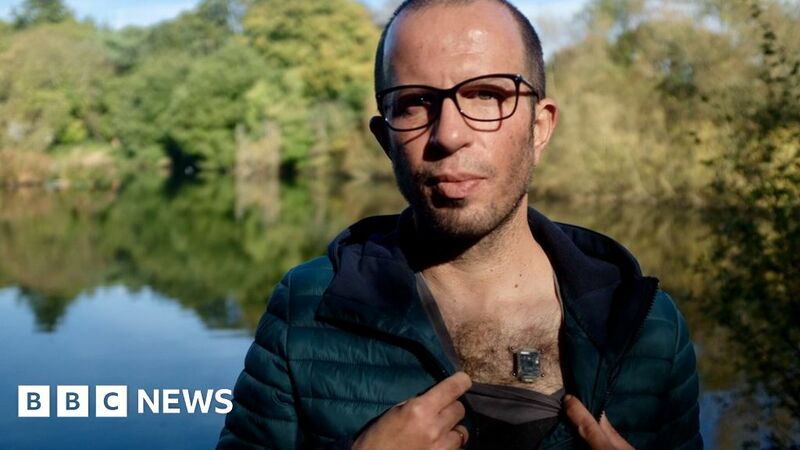 Luke Robert Mason, director of the Virtual Futures organisation, says there is a great deal of excitement around biohacking but “we are a long way from radically altering the human body in the sorts of ways they evangelise”. “What we see today are the first steps by a brave group of pioneers. Today’s reality is a lot more experimental (and painful) than is often communicated to the public. There are biohackers working with far less extreme – though still very experimental – methods. Corina Ingram-Noehr, 33, an American events organiser living in Berlin, has a daily ritual involving technology, diet and more than 20 different vitamin supplements to try to keep in peak physical condition. Next to a cupboard that resembles a chemist’s shop, she also has a Power Plate, which vibrates from 30 to 50 times a second to make her exercise more effective. And while vibrating, she uses an infrared light in an attempt to build collagen in her skin. Corina can also be found walking the freezing cold streets of Berlin with bare legs. She calls this her cheap biohack version of cryotherapy – or cold therapy – and admits the “cops on her street” think it is hilarious. She discovered biohacking when recovering from a serious concussion that left struggling to speak. Her boss recommended trying medium chain triglycerides (MCT) oil, which helped her “head turn on” and acted as something of a gateway drug for biohacking. The New ‘Game Of Thrones’ Teaser May Cause You To Freak Out. Here’s Why You Shouldn’t.